Burell Built Exteriors is proud to be the one-stop-solution for all of your residential roofing needs! We offer over 20 years of experience in residential roofing, and want to make it simple for homeowners to make a single phone call to reach full service roofing and exterior professionals. 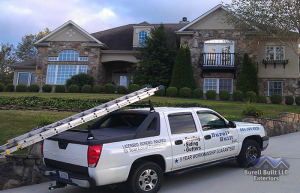 Call us for exterior needs and residential roofing for your Knoxville, TN or Chattanooga, TN area home! Financing available as low as $80 per month. Visit our FAQs page to learn more about residential roofing projects with Burell Built. The Burell Built Exteriors family offers comprehensive service support for homeowners to maintain, repair, and make the most of their homes! Roof Repairs – Many factors can impact the performance of your roof, so our repair division is highly-skilled and ready to quickly inspect the damage and work with you toward a solution. We work with a wide range of roofing materials and manufacturers to bring expertise to every call we receive, including emergency repair calls to our Knoxville, TN and Chattanooga, TN neighbors. Roof Replacement – Considering a full replacement of your home’s roof? Count on our team to properly tear off and install your beautiful new roof, and let us assist you with choosing the right material and approach for the installation. Fully removing old, worn roofs allows us to check the underlying decking to ensure there are no rotted spots or damage that needs to be addressed before adding new shingles, slate, metal, etc. Many replacement jobs can be completed in a single day, and we go out of our way to protect the rest of your home exterior and properly clean up when the work is complete. To see us in action, check out our residential roofing gallery and our commercial roofing gallery. To hear from some of our customers, visit our reviews page! For all your residential roofing needs in Knoxville and Chattanooga, TN, contact the Burell Built Exteriors team! Updated on November 16, 2016 at 5:42 pm by Burell Built Exteriors.